Best summer cocktail for all of us who like easy is this Moonshine Melon Mint Cocktail, with pure-clean local moonshine from Belle Isle Craft Spirits and watermelon juice. Too wiped out from the humidity to make mint simple syrup? Sure, purchase a good brand made with real sugar and you are all set for a colorful addition to your cocktail repertoire. Gotta admit that I veered from my usual seasonal approach to eating and purchased watermelon all winter long. It’s my favorite fruit. Plain is good, sprinkled with a crunchy fleur de sel is even better and gracing the table in savory form with Watermelon with Spicy Tahini Sauce is the ultimate indulgence. Since we’re all big fans of anything make-ahead, know that the tahini sauce is a good fridge keeper and easy enough to bring out for a showstopping presentation. Speaking of easy, you can now find watermelon juice (sometimes known as watermelon water) in the refrigerated sections of most grocery stores. Sure beats cutting up a melon and sending it through a blender and extracting the precious liquid. Plus, I have this thing about not sending stuff unnecessarily to the compost pile; what would I do with all that watermelon pulp? So, easy. Blend watermelon juice with clean moonshine (Belle Isle makes theirs with organic corn), add mint simple syrup and, if you like a hint of bitter, add a couple dashes of Angostura bitters, lending a Campari-like vibe to your cocktail. These bitters are a little pricey unless you plan to get good use in the future, and omitting them won’t detract from the original intention of this cocktail. If you like moonshine like I do, consider making my Apples and Oranges Cocktail when cider season rolls around again. 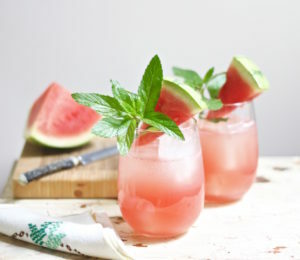 Combine moonshine, watermelon juice and mint simple syrup in shaker or clean jar. Add Angostura bitters if you like a Campari-like taste. Fill tumbler or stemless wine glass with ice cubes, add cocktail mixture and top off with seltzer. Garnish with watermelon and mint.